Think back to the 2016 election cycle. Many of those elected for the first time said it was wrong to transfer money from the highway fund or defer KPERS pension payments to balance the budget. Some of them also said spending should not exceed tax revenue, but very few, if any, said they wanted to dramatically raise income tax on all citizens and add start taxing the lowest earners in Kansas who had been previously exempt from state income tax. But once elected, that’s exactly what they did – including the highway transfers and KPERS delays – knowing that spending would exceed tax revenue within two years. Our September 2018 statewide public opinion survey shows very little support for the budget-balancing methods used by the majority of current legislators – tax increases, transferring money from the highway fund and delaying KPERS pension payments. Only 37 percent of voters are willing to pay higher taxes to balance the budget. Just 16 percent say legislators should allow an approximate $625 million state income tax increase over the next four years due to changes in federal tax law. And a mere 13 percent of voters approve of accounting maneuvers like transferring money from the highway fund and delaying pension payments. Whoever is elected governor and to the Kansas House of Representatives this fall will have to deal with this budget shortfall, and citizens deserve to know the issue exists and how legislators intend to resolve it. Kansas Policy Institute does not support or oppose candidates for public office, but we do provide educational information to the public about key economic and education issues facing Kansans. Our 2018 Voter Issue Guide is intended to arm readers with facts and key questions to consider so each reader can be better informed on the issues. This article provides a deeper examination of the looming budget shortfall, which is the first of five issues covered in the 2018 Voter Issue Guide. 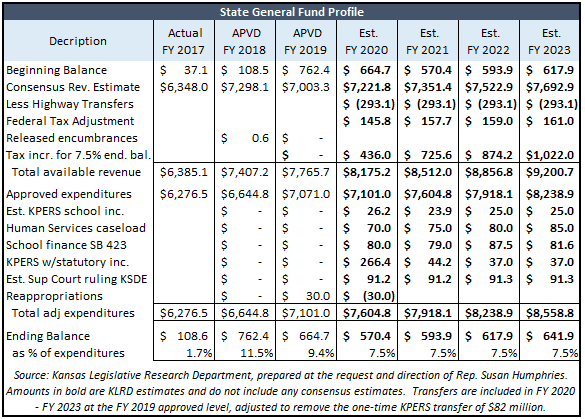 Calculations by Kansas Legislative Research Department show a $3.7 billion revenue shortfall exists over the next four years to pay for approved and proposed school funding increases if no money is taken from the highway fund, pension payments are made as scheduled and legally-required ending balances are maintained. The shortfall includes a roughly $625 million income tax increase that will occur as a result of federal changes that eliminate personal exemptions and cap deductions for some people who itemize. School funding approved by previous legislatures generate a $2.1 billion shortfall and complying the latest court ruling would create a $940 million shortfall over the next four years. There are many options to avoid a tax increase. Some are excellent opportunities to make government more efficient (like reducing wasteful spending or utilizing excess cash reserves) and others are not ideal policy but definitely better than a tax increase (e.g., transferring highway funds or securitizing future tobacco settlements). The list below is not exhaustive, but still demonstrates that tax increases can be avoided. — Expand the legislative budget process to a full-year cycle and thoroughly review opportunities to reduce costs identified in the performance-based budget system. Given these facts, here are a few questions every citizen should consider. — Should Kansans be subject to a back-door income tax increase due to federal tax law changes? — Should any type of tax increase be imposed on Kansans? — What specific actions should be undertaken to close a $3 billion revenue shortfall over the next four years resulting from school funding increases?